Dust and fingerprints are the biggest enemies of extremely high image quality and they also impair the optical performance of high-quality lenses or optical filters. Heavy residue on the filter, the lens front, and even on the rear of the lens can reduce the amount of light that is allowed through to the sensor so strongly that stray light, ghost images and reflections diminish contrast and weaken colour saturation. 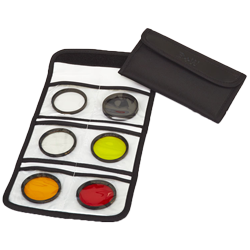 Regular and above all correct cleaning of lenses and filters is therefore paramount for serious photographers. B+W provides new professional cleaning and maintenance products for precisely these purposes. Optical filters, front and rear lenses of DSLR cameras, CSC-, MFT system cameras, compact cameras, video cameras and camcorders, as well as spotting scopes, binoculars and telescopes, smart phones, tablets and coated eyeglass lenses. include a practical draw-cord pouch in which the utensils can be kept. Held together compactly like this, it can also be kept in a smaller camera bag. The pouch is big enough to accommodate further contents depending on personal needs. With its highly effective cleaning substances the tried and tested pump spray for highly sensitive optical surfaces also removes firmly adhering dirt particles that cannot be removed by brush and microfiber cloth alone. The pump spray is easy to use and leaves no unwanted residues on the lens or filter glass. The safety datasheet can be found in our Download Center. 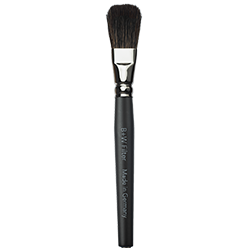 The hairs of the new B+W cleaning brush are made of very fine goat hair which gently and effectively remove above all loose dust and dirt particles from sensitive optical surfaces. 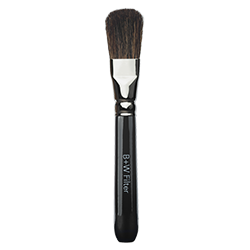 The brush hairs are natural, undyed and not cut. This means that there are no angular ends, and the hair tips glide gently over the surface to be cleaned. At 12 cm long the cleaning brush is compact and comes in a special tube to protect the delicate goat hair. Only available as a part of a cleaning set (see below). 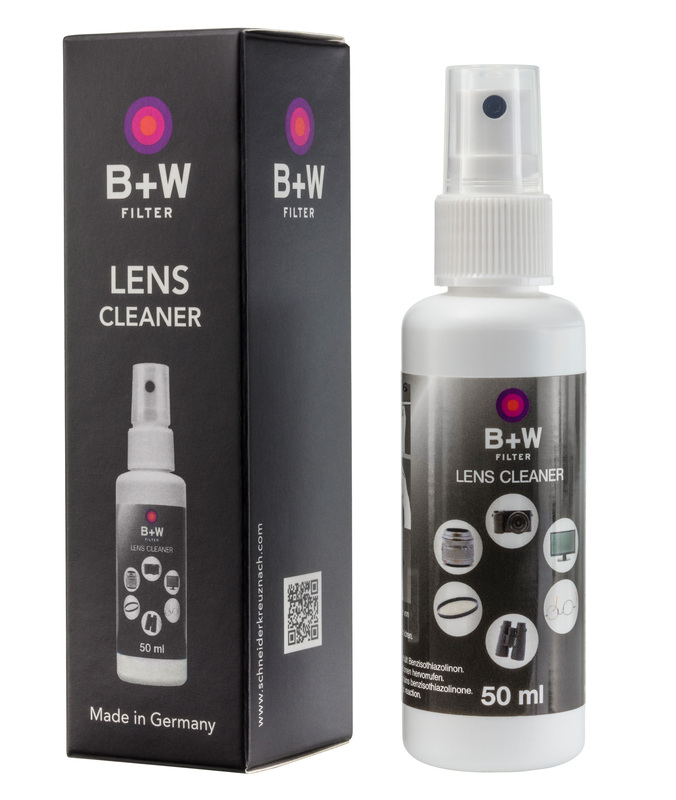 Microfibers for perfect cleanliness The new B+W microfiber cloth provides high cleaning efficiency and is especially suitable for coated optical surfaces such as photo filters and lenses. Thanks to its size and its flat surface without eleva-tions, it is easy and efficient to use. The cloth is washable up to 40° C and should be washed by hand after being used about eight to ten times with a mild detergent and rinsed thoroughly. The cloth is supplied in a sturdy case. The size 20 x 20 cm only available as a part in the cleaning set 5 part. The new bellows from optical specialist B+W helps when contactlessly removing loose dust on sensitive optical surfaces. 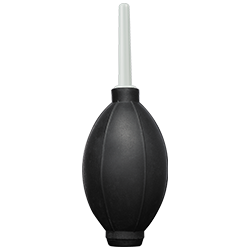 With a total length of 15 cm and a generously sized hand bellows made of easycare, durable rubber, it lies very well in the hand. The powerful air flow can be guided precisely using the attached air nozzle. Not only lenses and filters, but also inaccessible parts of sensitive equipment surfaces can be kept clean using the hand bellows. Moreover, it is suitable for device-friendly dust removal on the inside of precision devices such as cameras (mirrors), watches, telescopes and more. The professional version of the cleaning brush is 15 cm long and also made from high-quality goat hair. In addition, the brush has a magnet at the lower end and can therefore always be placed ready to hand at the workplace. Clear is made from a high-tech microfiber which is free of chemicals and lint, and cleans gently but thoroughly. It can be washed in an environmentally safe manner, and used again and again without losing any of its properties – an accessory of frequently underestimated importance for imaging performance. Available in approx. 18 × 18 cm and 31 × 37 cm sizes, each with a protective plastic envelope. 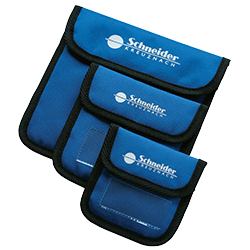 These filter pouches are made of padded, heavyduty and water-repellent nylon fabric with practical Velcro fasteners and a white space for labeling. The folding, foam-padded pouch made of flexible plastic material can hold up to six filters. Snap fasteners and transparent inner compartments ensure quick, easy access and the secure positioning of the filters. When folded, the pouch also fits into the front compartment of a photo bag for fast, convenient removal. 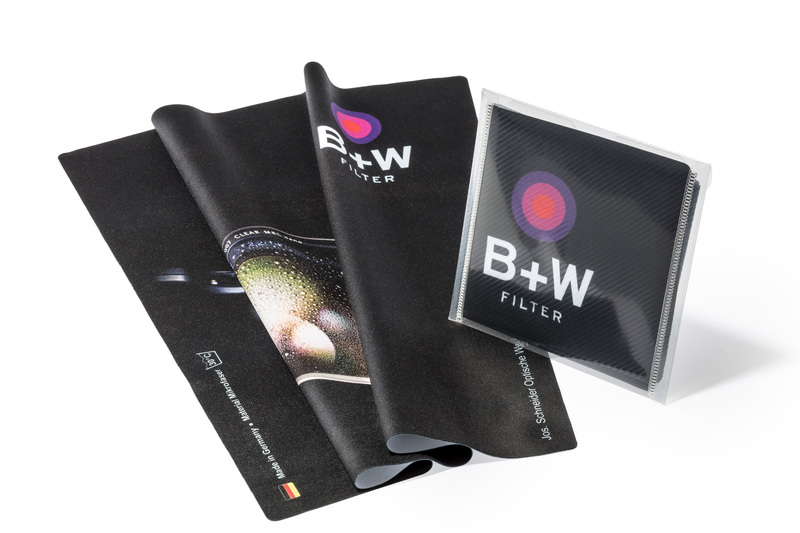 B+W provides various cases for the safe, dust-proof storage of filters. The flat, handy filter cases made of hard but gray transparent plastic let you see right away which filter is stored inside. A shock-absorbing foam insert prevents slipping and rattling. The sturdy individual cases are available in three sizes, with additionally available inserts reducing the dimensions for smaller filters. 1093879 B+W Photo Clear Box Pink, 12 pc. 1093880 B+W Photo Clear Box Navy, 12 pc. 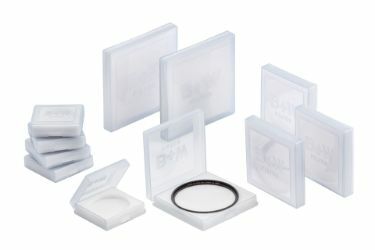 1093881 B+W Photo Clear Box Black, 12 pc.